So, the plan was to try the foie gras burger special at Sweets & Savories, which is on special for $10 Wednesday nights. There weren’t any reservations available this morning, but I figured if I went early enough I could at least wait for a table, you know, like at a normal restaurant. Nope. They were all booked and couldn’t possibly take anyone else. No, no, no. Something about having only one chef and not enough food. I deployed my dinner date, who is much cuter, and more importantly, finagles her way into exclusive places for a living (she’s the host/producer of a show called Chicago Revealed, after all), but still no dice. Now, I admit I’ve never worked in the food industry, but I did have to manage guest lists for events, and really, there are far more diplomatic ways to handle this kind of situation. Like, just lie and say you’ll put us on a list, and see if we bother to come back. Because this way, you just look like a jerk, and so does the restaurant by extension. And, to the management? If you’re going to issue a Groupon, maybe you should anticipate a higher volume, and staff accordingly, especially after the first two months of being full to capacity. Now we were really in the mood for burgers, and I didn’t feel like having a pub burger, especially since we were both a little dressed up. (I even put on makeup!) Since my date, Katie, had never been to Hot Chocolate, and it was on my list, we headed that way. And got seats. Without waiting. Which they would have let us, if we had to. I hadn’t been to Hot Chocolate in a few years (? 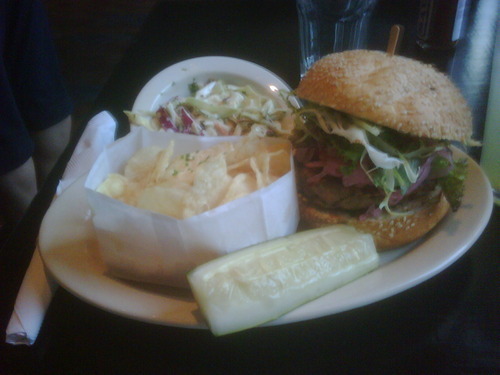 ), but the burger is one of the things (actually, the only thing…besides the hot chocolate, of course) that I remember. They had an upscale burger before it got trendy and everyone was offering Kobe with truffle aioli and housemade giardinera and whatnot. Aren’t the mini condiment bottles darling? It was as good as I remembered. It comes topped with bacon and cheddar; the egg is extra, but totally worth it. The patty is so well-seasoned and flavorful that it doesn’t really need much else. They use Heartland beef, which is Piedmontese, a breed that allegedly is leaner and more flavorful than standard American beef. As you might expect from a restaurant helmed by a pastry chef, the bun is spectacular, kind of a garlic-and-sesame studded pretzel roll. Totally hit my burger spot. Ice cream is “housemade,” of course. The clear winner of the night was the sweet corn (far left), followed by the chocolate chip cookie garnish. The rest of the flavors (from left to right): brown butter sour cream (which needed a pie garnish), plum (more tart than I expected, but in a good, refreshing way), and banana chocolate chip marshmallow (the biggest letdown of the bunch — not enough marshmallow). I’m still going to attempt S&S next week, but they’re really going to have to bring it to stack up to this burger. (So to speak.) I’m not sure if foie and truffles are enough. First, let me just say this to all the super-picky eaters out there, the ones who only eat the same ten meals their entire lives: I don’t know how you do it. I’m only a week into my Month of Burgers, and I’m already getting a little tired of having the same thing every day. Not to mention that having six to eight ounces of beef every day, often accompanied by fries, is a wee bit taxing on the old digestive system. Good thing I’m biking to most of these locations. I’ve been curious about Patty Burger for a while, but didn’t find myself downtown during lunch hours much back when I had a job. Today I decided to flee my AC- and electricity-less house for the Art Institute for the Henri Cartier-Bresson exhibit. While a “French” burger would have been a more fitting follow-up, the Camembert burger at The Gage was a little rich for my tastes (the financial ones, not actual taste buds), so Patty Burger it was. The Patty Burger schtick is that they offer “gourmet” burgers (read: lots of toppings) at fast food prices. Or something like that. The burgers are kind of pricey, starting at $4 for a regular burger and going up to almost $6 for the ones with the fancy toppings, and fries are extra. I decided to get the Bluegrass, which has mushrooms, bacon, grilled onions, and cheddar. 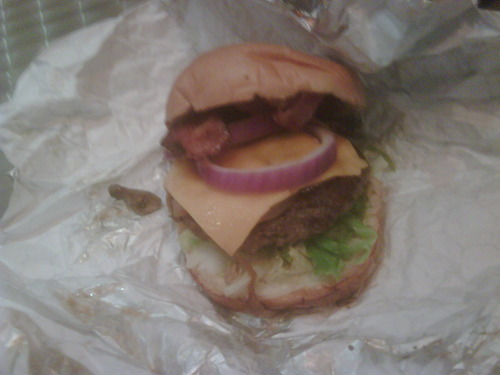 It also came with red onion, which I thought was redundant. For the sake of my waistline, I forewent the fries and the shake. I mean, the cheese isn’t even melted! 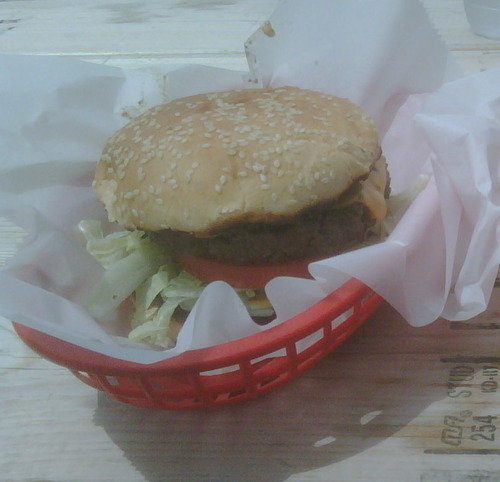 The burger itself was kind of greasy, despite being more cooked than others I’ve had, and oddly bland. I don’t think it would have had any flavor if it weren’t for the bacon and onions. 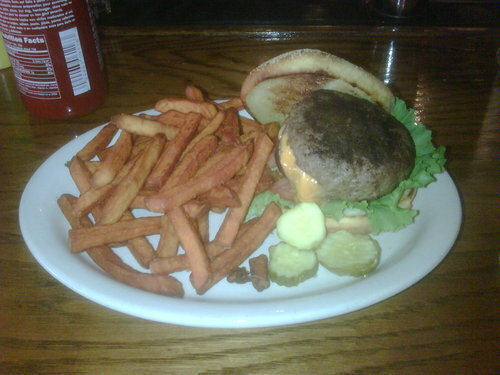 And I don’t mean just salt; the patty was seriously lacking in the beefiness department. 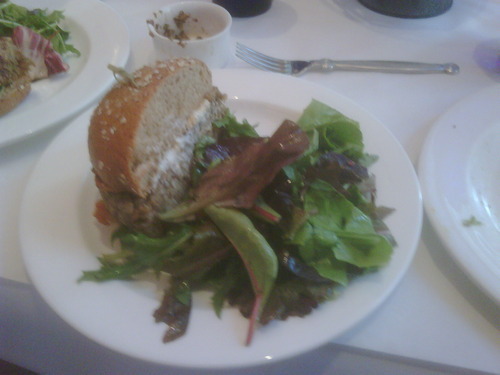 The bun was good, but overall, this was the most boring burger I’ve had so far. I wish I’d schlepped the extra distance to Epic Burger instead. Hopefully tomorrow’s Kobe burger at Sweets & Savories will make up for it. My housemate, Abdul, has accused me of only eating are “elitist” burgers. To which I say: half the point of this is to go sit in air conditioning, which they don’t usually have at your local hole-in-the-wall. But I thought he had a point, and eating “gourmet” burgers every day is getting a bit expensive, so I decided to go to BIG & Little’s, where they’ve got truffle fries but no AC. Luckily it was a pleasant day so it wasn’t much of an issue. The place is located on N Orleans along what I’ve heard is called the cabbie restaurant row; its nearest neighbors are a Pakistani restaurant and a liquor store. The burger itself is an excellent basic burger (though not Chicago’s best, as claimed by one Yelp reviewer), the kind you hope to get at a cookout or your local diner/grill: beefy (but not too thick) patty, no exotic condiments or fancy cheeses. It also demonstrates why a good bun is so important. What’s the point of serving a juicy, hand-formed, grilled-to-order patty on a bun that disintegrates into a wonderbread pulp three seconds after you start eating it? People ask what truffle tastes like. Not mushrooms. As far as I can tell, truffles are basically pure umami, sometimes called the “fifth taste.” Think of the savory deliciousness of a perfectly roasted chicken or steak (or grilled portabellas or something, for all the vegetarians out there). In powder form, truffles are kind of like culinary crack, or Western-style MSG. Coat some freshly deep-fried potatoes with this pixie dust and they’re basically irresistable. Reader, I ate the entire basket. Patty: 90/10 ground beef, well-done, thanks to all the flare-ups on my grill. The beef is from the overpriced grocery that is the only decent grocery store within walking distance; I don’t know if it’s grass-fed/organic/yada-yada, but at that price I hope it was. 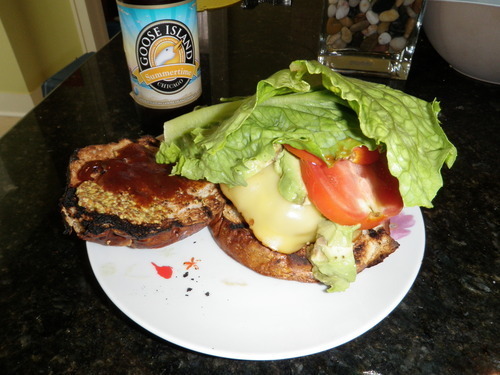 Toppings: Smoked gouda, avocado, tomato, lettuce, grain mustard, and BBQ sauce I had left over from Fat Willy’s. Bun: Pretzel roll, frozen, from the supermarket. Did it stack up to restaurant burgers? : That was my other challenge. I don’t actually make burgers very often at home, and when I do, it’s usually the Japanese-style hambaagu, which is really a giant meatball and eaten with rice rather than on a bun. This time, I made an American-style patty with nothing but steak seasoning (the secret ingredient is MSG), salt, and pepper, and despite my fears, it neither fell apart nor turned out tough. (It did drip quite a bit, however, so I was greeted with flames when I went to flip it.) However, I can now see the arguments for the fresh-ground quality restaurant patty: my burger didn’t have the same succulence or beefiness of the best burgers I’ve had so far. Still, it’s good to know I can rely on my own powers should I ever want a burger in Malaysia (which, after I’m done with this month, I don’t know I will). J Wellington’s is a burger joint about ten minutes from my house and one of the inspirations for the Month of Burgers, since they have seriously good burgers, shakes, and fries that I’m going to miss while I’m gone. The store is named for the burger-loving character from Popeye (last name: Wimpy), and the menu is filled with what I’m guessing are Popeye references, none of which I get. Like the One-Eyed Runt. I decided to get it since it was my first meal of the day and I figured the bacon and egg made this burger breakfast-esque. (The rest of the toppings are blue cheese and Sriracha mayo.) I rounded out my meal with fries (standing in for hash browns) and a strawberry shake for my fruit/vegetable. No, I have not keeled over from a heart attack. Yet. Thanks to the combo of runny egg, mayo, and melted cheese, this is a very messy burger. The J Wellington patty splits the difference between a thin, fast-food style and the thick steakhouse style, so you get a pretty substantial burger that’s still manageable (i.e., you don’t have to unhinge your jaw to get your mouth around it). You can get a wheat bun, but keeping with the healthy eating plan I’d already set I opted for the classic, which is in a challah/egg-bread style that’s soft but still holds up. And they’ve got mini-burgers. You can get a flight of the five specialty burgers, which is probably too much for one person but good for two (and cheaper than getting two burgers). The cutest part is that they use a quail egg for the mini version of the One-Eye. Now I’ll have to go to a Wimpy’s to see how it stacks up. The problem with many turkey burgers is that they end up dry, gamy, or rubbery. The Birchwood’s version was moist but pleasantly light, which is what you look for after two days of red meat. Pickled onions provided both onioniness and tanginess. The bun was nothing special, which is a bit surprising, because these guys are usually all about the bread. Today I worked up an appetite hunting wedding dresses at Filene’s Basement’s Running of the Brides, which really should be called “Shuffling of the Brides” or maybe “Queuing of the Brides.” There’s not much running when you’re trying to get hundreds of women (and maybe two men) into a store. Inside was like a southeast Asian bazaar, except everyone was trading the same thing. We did find a great dress for my friend, though. Afterwards her mom treated us to a lovely lunch at Atwood Cafe, where I split a duck confit salad (awesome) and a mushroom-rice burger. Veggie burgers are tricky, too; you want to match the heartiness of a beefburger, without using actual beef. Texturized soy protein is too crumbly to bind into a patty, and tofu is finicky and doesn’t hold together very well (unless you add pork, which solidly defeats the point). And then there’s the flavor issue: there are any number of vegetables you can mash into a patty, but few that give that meaty oomph called umami. Luckily, mushrooms deliver umami in high doses (what do you think makes truffles so yummy?). I thought Atwood’s version was a bit starchy, more like a mushroom risotto cake on a bun, but that might be because I had my friend’s awesome (and less grain-based) mushroom burgers only a week before. Still, this is a veggie burger to be proud of, and I hope more restaurants undertake the challenge of the creating a housemade veggie burger instead of relying on pre-made patties. Look, you wouldn’t try to pass off a frozen beef patty on beefburger eaters„ so why relegate vegetarians to the culinary ghetto of the Gardenburger? Tomorrow: Does a fried egg make a burger breakfast food? Small Bar has the distinction of the closest place to my house with both A/C and burgers, so I escaped my stifling house for lunch. Luckily, their burgers are delicious. The genius of this burger (the Juicy Lucy, a “Minneapolis specialty,” according to the menu) is that the cheese is inside the patty. Further, it’s Merkt’s cheese spread rather than a slice of cheese, so the texture is oozy rather than gooey. Imagine a savory Hostess cupcake, with beef standing in for the cake and cheese for the crème filling. I also appreciated the quality buns. The last thing you need when tucking into a juicy, cheese-filled hunk of beef is a bun that disintegrates into a soggy mess. This was actually the subject of a story in Oishinbo, a Japanese comic about newspaper writers who change lives for the better through food. Kind of like if Good Eats was turned into a serialized graphic novel. Or something. Anyway, there’s one episode where this guy is trying to open a gourmet burger stand, but he can’t understand why he’s not getting any (repeat) business. Turns out that his cheap, flimsy buns aren’t holding up to the meaty patties, and once he improves the bun, the customers arrive in droves. Since I read this as an impressionable adolescent, I’ve always used the bun as a litmus test. Next up: Probably this place. 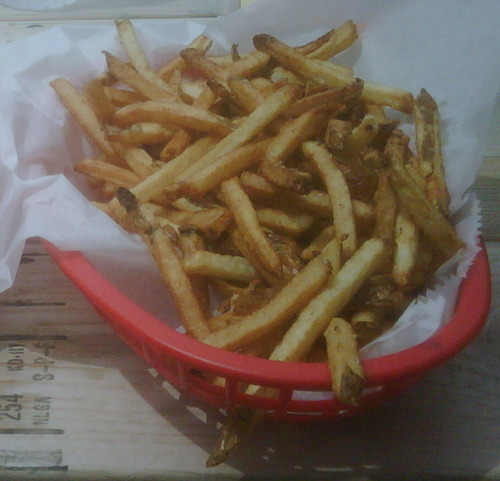 (They’ve got truffle fries!) Although it might be hard to pass up the fish tacos.